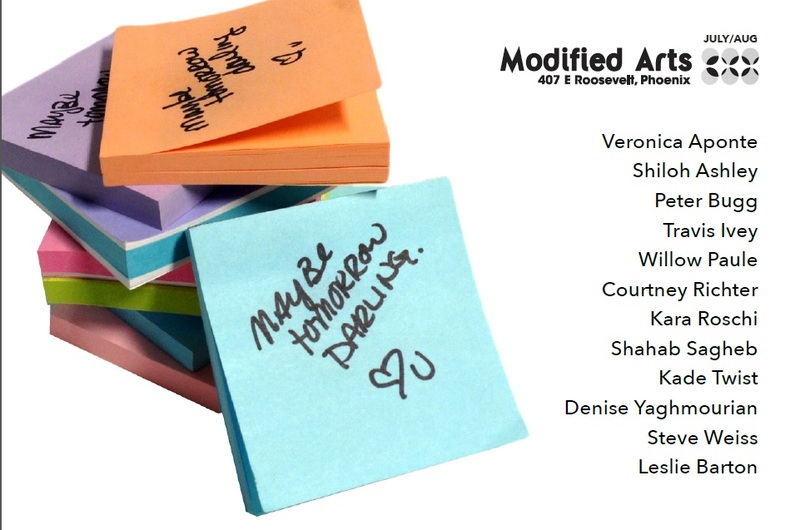 “Maybe Tomorrow, Darling” is an art installation, gallery exhibition, and cathartic exercise for Arizona State University’s graduate students, local alumni, and community artists. Each creative contribution to the exhibition uses the visual, conceptual, and material language of the office place to consider the relationship between being and doing, art and life, art work and “work-work”. Curated by participating artist Kara Roschi. Participating artists include: Veronica Aponte, Shiloh Ashley, Peter Bugg, Travis Ivey, Willow Paule, Courtney Richter, Kara Roschi, Shahab Sagheb, Kade Twist, Denise Yaghmourian, Steve Weiss, Leslie Barton, and Practical Art artisans. Special thanks to Adam Goodman of Goodmans Interior Structures. Kara Roschi is an interdisciplinary artist, curator, and Arizona State University graduate student in pursuit of her MFA degree. She has co-curated over 70 exhibitions, and is currently Chief Curator for Curator Engine, a local arts placement service. Roschi is also certified as a docent at the Phoenix Art Museum, and particularly enjoys conversations with the public around the Contemporary Collection. Her artistic investigations center on the organization of both information and community, and how they conflate. Her research and production processes borrow from the fields of performance, social practice, and web media.